Barcelona's priority transfer target this summer. Barcelona have earmarked Eintracht Frankfurt's Luka Jovic as their number one priority in the summer transfer window. 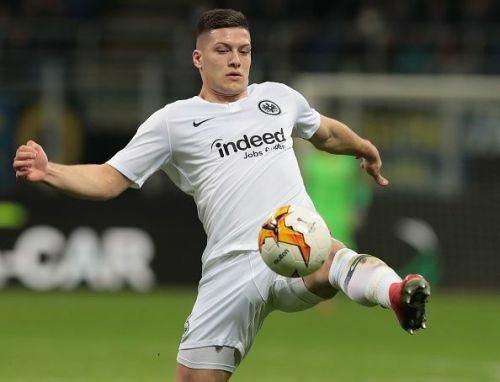 Luka Jovic has been in phenomenal form for Eintracht Frankfurt this season where he has scored 15 goals and provided 5 assists in the Bundesliga so far. He has also taken the UEFA Europa League by storm and has scored 7 goals in the competition. His goal against Inter Milan in the Europa League Round of 16 carried Frankfurt into the quarter-finals of the competition. Luka Jovic averages 2.8 shots per game in the Bundesliga, 2.4 of which are from inside the box. The 21-year old Serbian is capable of playing as a number 10 as well as a traditional number 9. Luka Jovic's form in the Bundesliga this season has earned him a lot of attention across Europe. Many of the top clubs are interested in his service with reports suggesting Chelsea and Barcelona leading the race for the Serbian hitman. According to Gerard Romero of the EsportsRAC 1 radio, Barcelona's delegation has met with Luka Jovic's entourage in Milan to let them know that the Serbian is the club's number one priority signing in the upcoming transfer window. Barcelona wants Jovic to replace the aging Luis Suarez and will be ready to splash the cash for the Serbian international. Jovic will cost Barcelona around €60 million if they hope to seal the deal, but the price is a bargain considering the age and unmatched potential of the striker. This is not the first time Barca has been linked with a move for Luka Jovic. They do have a problem in attacking area and will have to replace Luis Suarez sooner or later. Luka Jovic looks like a very realistic target for them. Barcelona will face bitter rivals Espanyol at the Camp Nou when league football returns after the international break. They will also face Manchester United in the UEFA Champions League quarter-final. Analyzing Luka Jovic and where he could end up next season.